Carolyn Gold Heilbrun was an American academic and prolific feminist author of both important academic studies and popular mystery novels under the pen name of Amanda Cross. Heilbrun was born in East Orange, New Jersey, to Archibald Gold and Estelle Roemer Gold. The family moved to Manhattan when she was a child. She graduated from Wellesley College in 1947 at the top of her class. She married James Heilbrun (1923-2008) during World War II, and they had three children. 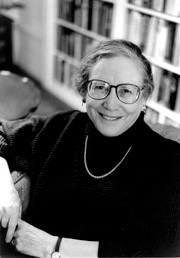 Heilbrun committed suicide at her apartment in New York City in 2003. According to her son,novelist Robert Heilbrun, she was not ill but felt her life had been completed. A nearby note read "The journey is over. Love to all." Thinking about profound social change, conservatives always expect disaster, while revolutionaries confidentially expect utopia. Both are wrong.